The Feather River Canyon wouldn’t be considered the most trustworthy place to transport hazardous material. With frequent rockslides, occasional derailments, and the activity of PG&E and logging companies, the Feather River is always at risk of accidental contamination. 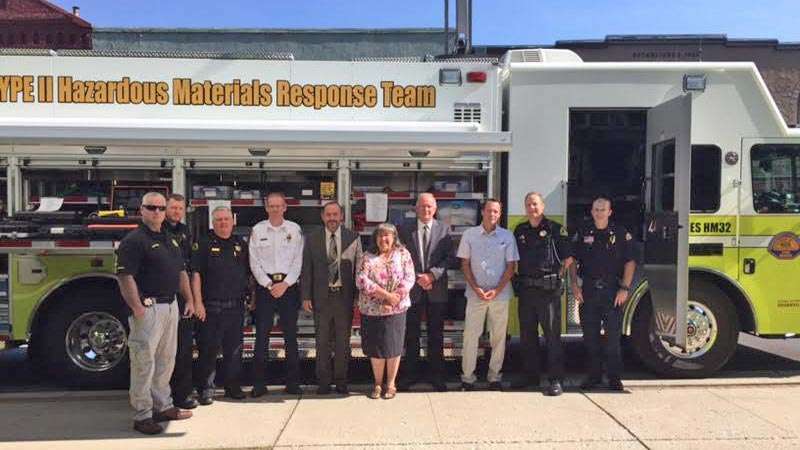 Now, the county has a better chance of combatting spills with the arrival of a brand new $1 million HazMat Type II Vehicle. One of 12 in the state, the new vehicle was acquired through a partnership between Lassen, Modoc and Plumas Office of Emergency Service departments, including local fire departments and the sheriff’s office. The new vehicle will be staffed by 17 highly trained local responders who will man the truck during hazardous material spills. According to Plumas County OES Assistant Chief Nick Dawson, the truck is fully equipped for any HazMat emergency. It is a portable lab that provides self-contained protective suits for responders. It has clean-up materials such as foam, and debris boom barriers to prevent contaminants from floating downriver. The acquisition of the truck was a mutual effort headed up by Susanville Fire Chief James Moore. Most regions are able to staff the truck within a single department, but full staffing requires at least 17 trained personnel, a number that no department has within the three counties. To ensure a full roster, fire departments and sheriff’s offices throughout the three counties presented participants to be trained and equipped to operate the vehicle. There are three members of the team in Plumas County: Sherriff’s Office Sergeant Travis Goings, Deputy John Cervantes and Chester Fireman Mark Murray. During a response, the truck has to be manned by five team members. In the case of a Plumas County emergency, Dawson said the three Plumas County responders can meet at the site, while an operator and another responder drive the vehicle from Susanville where it is housed. Because of the extensive training provided by the state, staff can test the spilled chemicals with portable kits and begin the decontamination process even before the truck has arrived. Dawson said training will go even further than the technician specialist level all 17 responders have obtained. He plans to launch a statewide training scenario in the canyon within the next few years to help prepare the entire state OES department and other HazMat operators and responders from different regions. Representatives from Region 3, including Moore and Dawson, presented the truck to the Plumas County Board of Supervisors at its regular meeting July 17. The board inspected the new vehicle as it was parked outside the county courthouse, and heard from Moore and Assistant Sheriff Dean Canalia during the meeting. “It is a very impressive truck,” said District 5 Supervisor Jeff Engel.